The most popular game of all time for Smartphones and Mobile devices name "Angry Birds" is now available for Windows Phone 7 users too. Now Windows Phone users can also play world’s most popular game Angry Birds on their devices. 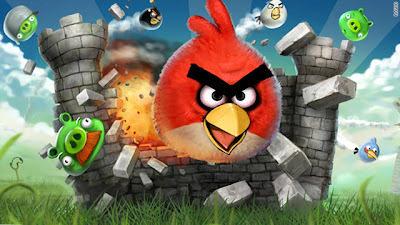 The game Angry Birds has launch with the collaboration of Rovio Mobile and Microsoft Studios. The game was first made originally only for Apple iOS, then Android and many other platforms including the web through Google Chrome, and finally it has made its debut on Microsoft’s latest mobile OS. Angry Birds is coming to Windows Phone! The survival of the angry birds is at stake. Dish out revenge on the green pigs who stole the birds’ eggs. Use the unique destructive powers of the angry birds to lay waste to the pigs’ fortified castles. Each of the 165 levels requires logic, skill and brute force to crush the enemy. Windows Phone version of Angry Birds is fully featured and loaded as their iOS/Android counterparts; however falls slightly short on the level count, as the Windows Phone 7 version only has 165 levels in comparison to the 255 available on Android currently. This is made up for with full Xbox LIVE integration, as you’d expect from a Microsoft Studio’s published games. Angry Birds is now available for the price of USD 2.99$ at the Marketplace. We know this price is higher than other mobile platforms, but still it's great to see the famous Angry Birds make its way on Windows Phone 7, but if you don’t want to spend the money right now, don’t worry, you can also try a free trial version if you want to test out the game before you buy it. You can get Angry Birds for Windows Phone 7 now via the Marketplace here.